Getting updates on road conditions and traffic congestion to drivers have been a concern for transit authorities the world over. While updates in the local TV and radio news, road signs, and more recently apps have done the job for years, some cities such as London are becoming more innovative in their approach. The Transport for London authority is adding the rear windows of public transit to the method of getting road reports out to drivers and riders. What the TfL has done is basically add a smaller road sign to the back window as opposed to making the entire back window a display for road information. It’s an idea that could be expanded on at a future time such as including boards to the sides of the buses. The six month test run is an attempt to keep drivers from looking at their smartphones and tablets while driving by having them look at buses’ rear windows—since their eyes should be ahead most of the time anyway while behind the road. Currently the transit authority uses buses that run on London’s route 344 running the length of Clapham Junction and Liverpool Street. 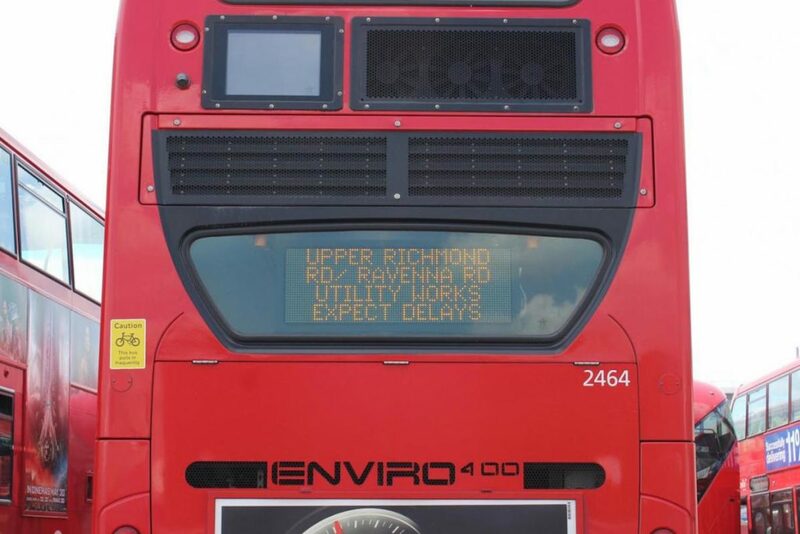 As is the case with any test run, there are plans to add more and expand the amount of buses the window notifications appear on as well as routes. This could definitely add to the effectiveness of the goal to keep eyes on the road when it comes to road updates.